Nutcracker 2013! - Super Inky! Happy Nutcracker Season! This year my moms took me to see a Wednesday matinée. As always, we took a photo of me on the fountain in the middle of the plaza. I almost never wear a dress- except when I go to the ballet. This year, I chose this beautiful gold brocade dress with matching shoes. I felt quite elegant. Sometimes it is fun to get dressed up, don't you think? During the intermission we went out onto the balcony overlooking the plaza and had sparkling apple juice while we discussed Act I. After dancing in the Nutcracker for a few years, it was wonderful to just enjoy the performance from the audience. I had never danced in Act I, but watching the Battle Scene I wished I'd had the chance to be one of the soldiers who fights the mice. My mom thought I would have made a pretty party scene girl, but I strongly disagreed. Soon, it was time to return to the theatre for Act II! I loved watching Marie and the Little Prince visit the Kingdom of the Sweets. Once again, I remembered my time as a polichinelle. I loved performing, but I don't have the discipline to go to a long dance class every day except Sunday. At first I was regretting my decision to stop dancing, but when I remembered how nice it is to relax and have fun, I felt good about it. Plus, watching ballet is fantastic too! After the dancers took their bows, we filed out of the auditorium and into the promenade. Of course, we had to take photos there too! I know it's silly, but I love our family tradition of taking photos in the same places at the theatre every year. Before we left, we had to take one last photo of me by the stairs leading from the promenade down to the street level. This is another traditional photo spot. I had a wonderful time at the Nutcracker this year! I'm already looking forward to next year's performance and wondering what I will wear. Here's one last photo- a comparison of the dresses I wore for the past three years. Which one is your favorite? Have you ever gone to the ballet? What did you wear? 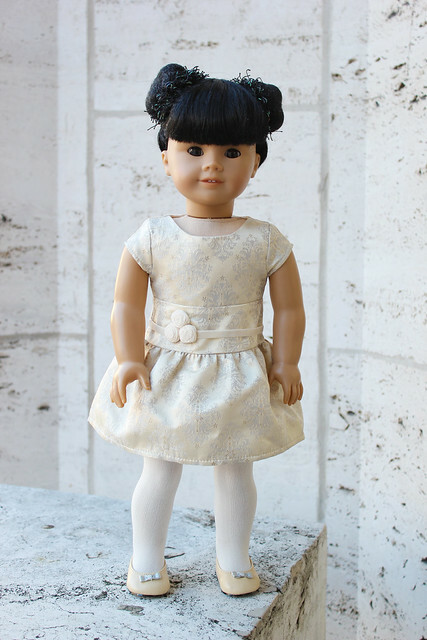 In this entry I'm wearing: the Brocade Holiday Dress from American Girl. I like your 2011 one! I see the nutcracker almost every year, but I don't think i have ever brought my dolls! Maybe this year I will! If you had a twin, what would her name be? What would she be like? I am thinking of trying to find a jly #4 (so basically, you) and I would love it if you could pick her name, her personality, how, or if she would be related to you? 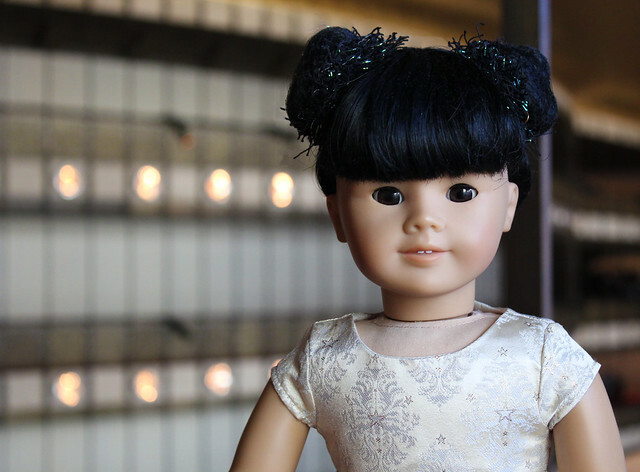 I think you are the most a-doll-able doll out there! So I would love your input on this! When I first discovered your blog this summer, I immediately read ALL and i mean ALL of your posts, starting with your very first post in 2007. It only took me 3 days! And to this day, I still fall in love with the sheer adorableness of your posts! 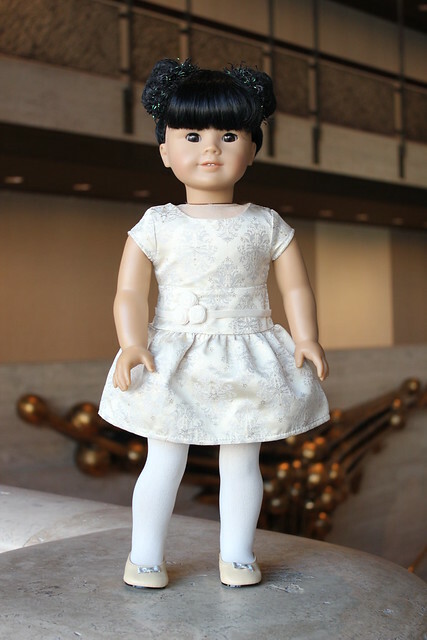 I would really love it if you could give me your advice on the doll. I don't know what my twin's name would be- I'm adopted so I don't know what my birthmom would have chosen. Thank you so much for being such a faithful reader of my blog! Aww! You are very welcome Inky! I studied ballet from when I was very small (about 3) until this summer. Of course until I was six, my lessons were not as formal as they were later on. Thanks for asking! 2012! Purple looks gorgeous on you! What a beautiful dress Inky! I wanted that one, but Mother said no, because it was dreadfully expensive, and she could easily make one like that herself. She's a fantabulous seamstress! Trimming the New Year Tree!